I know it’s not field herping, but the babies started coming out of their eggs today and I had to take some pictures. Here they are coming out and opening their eyes for the first time. 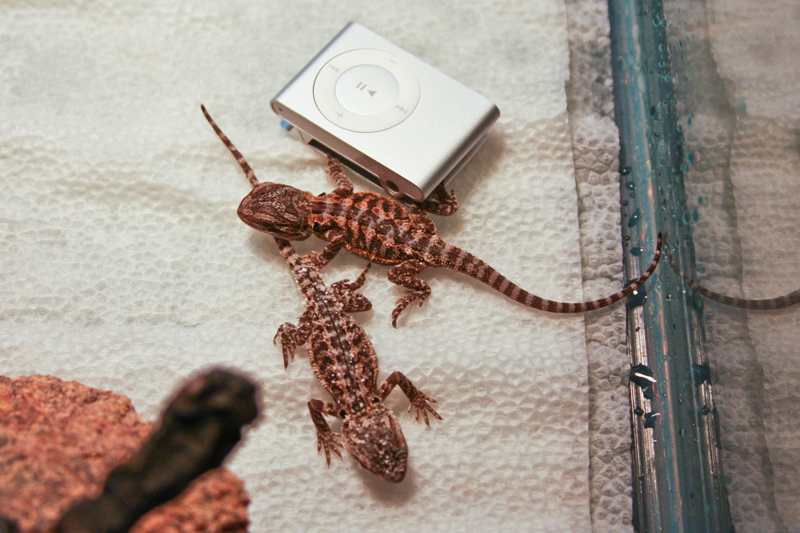 Here they are with my ipod shuffle for size comparizon. Here’s one that’s about 20 minutes old on his dad’s head. He isn’t sure what to think of them, other than that they probably look delicious. This entry was posted on Tuesday, May 13th, 2008 at 7:17 pm	and is filed under Captive & Husbandry, Personal. You can follow any responses to this entry through the RSS 2.0 feed. You can leave a response, or trackback from your own site. Thanks 🙂 Let me know if you need any help. I don’t know what the rules are over there as far as sending them through the mail, but it can be well worth it to pay some more for shipping to get a dragon you really like. While you’re making the investment, you might as well make it worth it. Thanks allot for the help, can’t wait to add to a tiny collection of my own. I’m most definitely adding your website to my favourites. I’m sure to be coming back very soon. Hi Sara, your English is just fine 🙂 That’s great that you’ve had your dragon for so long! Our oldest is about 4 now, and we’re hoping to have him a lot longer. That’s good advice about the keeping of multiple dragons in the same enclosure. You’re right, in many cases they’ll hurt eachother. It may be possible to keep two females that have been raised together in the same cage, but a male and female will never work. The male will “love” the female to death over time. Hi. Im Tyler, im get a beaded dragon in few months and i was wondering if they are good pets. I live in they north, but does it get to cold up here to have one. I had a African Plated Lizard, i had him for about 2 years, but he died:(. Before he died i took him to the vet and they said he probley got to cold, but i had a heat lamp and a hidding spot. So can any one tell me about the bearded dragon im getting. If you need to contact me my email is tyknox4@yahoo.com. Thanks. That depends, how far North do you live? You could keep them wherever in the world you want, as long as you are able to maintain a constant temperature warm enough or them to live. Do you have proper heating equipment, lighting, and thermometers available? They are good starter lizards, but you MUST provide correct lighting and heat, and don’t take any shortcuts. 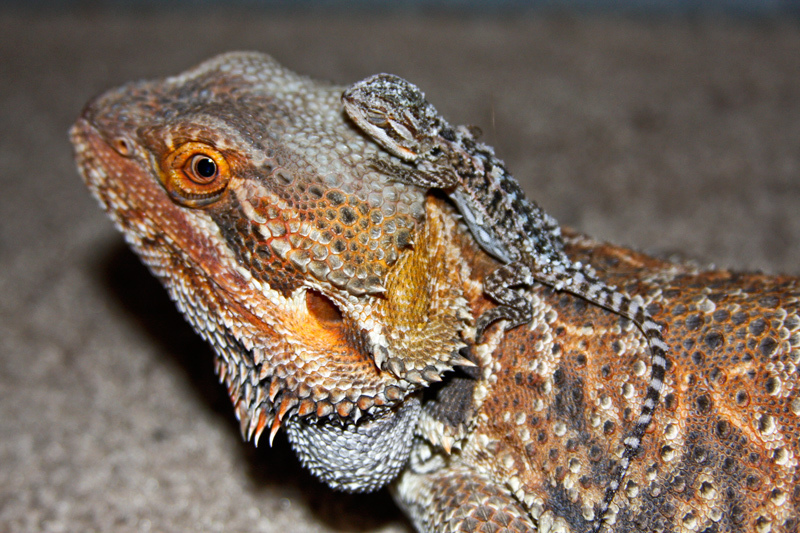 A healthy bearded dragon can live between 7 and 10 years or so. They are great lizards for beginners, but there’s a lot of work to be done in educating people about how to give them the correct lighting, etc. What kind of food were you feeding Draik? Maybe there is something that can be done differently to make sure it doesn’t happen to Leigho. I have some beardies that are soon to hatch . 3 Have already but died in the process. I am wondering if this is normal or am I doing something wrong . I have kept them in the incubater overnight but , there is still no movement . Hmm, that’s definitely not normal. What do you mean that they died “in process”, are they unable to make it out of the egg? Can you describe what’s happening? They made it out , they are laying still with the placenta still attached . I touched one and she isn’t hard . She is still kinda soft . I have never done this before and I can’t seem to find and info . I just thought they would come out of thier shell’s ready for action . Not lifeless , like this . Something is definitely wrong. They came out of the shells all by themselves, right? Put them in a different enclosure on damp paper towels. The thing on their bellies is not a placenta (that’s a mammal thing), it’s the last of the yolk. They came out by themselves . If I take them out could I put them under the lights on a damp paper towel or keep them in the incubater . They are 23 hours old now . Ya, try putting them in the new enclosure, just be careful to make sure the ground is a little damp. They can hurt themselves is that little yolk belly button gets stuck on something. Hopefully they snap out of it. Are they all that way? I have 30 eggs only 3 hatched this far . I believe they are 1 week early . I estamated 10 weeks and it has been 9 . Ah, ok. Leave them in there then 🙂 They can be stubborn. One time even weeks after the rest had hatched, I threw away the last 2 eggs that I was sure were bad. Later that day I found a baby dragon in the trash! Just leave the eggs as-is for awhile, and move the babies to the nursery tank when they come out. I moved the 3 babies . They are limp except for 1 [ he is kinda stiff ] but , I’ll keep him anyways . They are on a damp paper towel . Should I mist them every once in a while so they don’t dry out ? Thanks for all your support by the way . Ya, very gently mist them from time to time. Just give them some time, light, and warmth, and they may start perking up. Hopefully they’ll be hungry in a few days … and no problem, I certainly understand the stress of the first time through! Do you have any pics of them? Yeah on facebook . I have limited computer skills and I can’t e-mail pics to people . I may need advice again …. I believe for sure my little guys have passed . There is no movement after 32 hours . What couls I be doing wrong , to have them come this far and pass. My temps are good in the incubater …..
I’m really sorry to hear that 🙁 How about the other eggs, are they still viable/hatching? If I may ask, what did you do when she laid the eggs, can you describe how you put it all together? Maybe something obvious will stick out for the next time. No more eggs have hatched . They are all perfectly healthy looking . 2 more are starting to shrivil up so I am expecting them to hatch sometime today . I had the incubater ready between 82 and 84 , using vermiculite . I could never find what the dampness should be but it has been consistant all the way thru , damp but not soaking wet . The container is rubber maid and has holes along the side and as well in the lid . I actually set my incubarter up several months before breeding to make sure it was consistant . When she laid the eggs she did it on a flat surface . I removed them as she had them . I placed them in the vermiculite the same way they came out , making sure not to tip them in any way . And well the rest you know . Like I said the first 3 were born a week early . I counted out 10 weeks on my calender and they hatched 10 days early . But , I know there is no real science to that . The thermometer in the incubater that records dampness read 98 max , 99 min and sits at 75 % . Hmm, seems good to me! Who knows … they if the rest turn out ok, it might just be a fluke. Will you let me know how they do? What state do you live in? I live in Reddeer , Alberta , Canada. I will let you know because I’ll be very happy if I get any . So it’s been 12 weeks today and no more dragons have hatched . There are a few that have shrivelled up like raisens and a few that you can see the outline of the dragon thru the egg but no movement . I took 3 out last week that were shrivelled up really bad because it was start’n to smell . There also some eggs that are just normal . Should I toss the ones that are shrivelled or the ones that you can see the outline but , no movement . I am scared that they are rotting and may or may have already contaminated the good ones that are left ? Hmm, it’s hard to say. Is there any visible mold on them? Hmm, I’d just wait a little longer. What kind of substrate are they on in there? What do you use … maybe it’s better . I think this stuff holds to much moisture and I think that is the problem . Are the ones that I can see their outline … are they okay do you think . There is no movement that I can see . I used vermiculite as well, but it can really hold too much too easily and if there is any standing water touching them at all, they can die. If you see a shape in there, I’d leave it. I made that mistake once and found a baby dragon running around in the garbage. In another “dead” clutch, we left them in for another couple of weeks for the hell of it and they ALL hatched. Hi im breea from england but im in america right now and was wondering my mother had just given me a bearded dragon and he’s not very active and was wondering if thats okay or not because i hear that there suppose to be active??? I removed them as she had them . 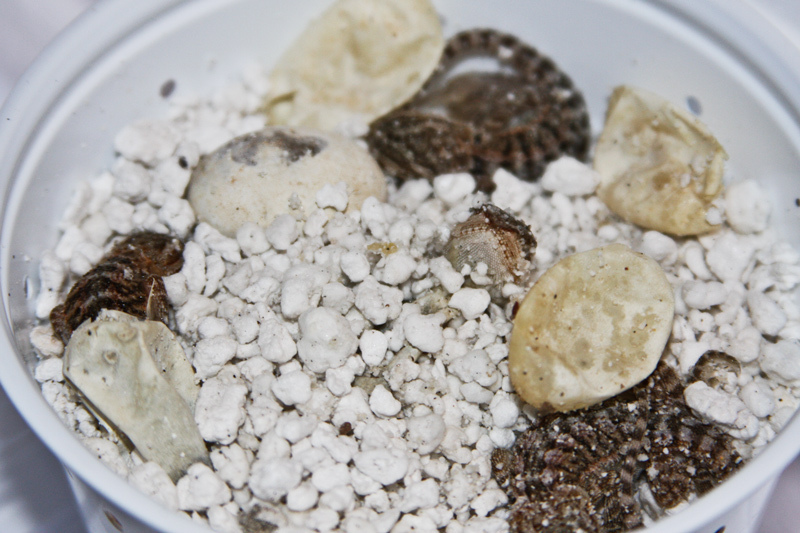 I placed them in the vermiculite the same way they came out , making sure not to tip them in any way . And well the rest you know . Like I said the first 3 were born a week early . I counted out 10 weeks on my calender and they hatched 10 days early . But , I know there is no real science to that . The thermometer in the incubater that records dampness read 98 max , 99 min and sits at 75 % . hey, i breed beardies and just wanted to say that a beardie can live up to 15+ years i know someone who has had his for 16 now and he is still kickin! my bearded dragon died 2 weeks ago I had him for 12 years he was 5 feet long when he died. I miss him so much. But he had kids with my brothers female so at least he had 2 boys and 1 girl.